Lately I've been playing with leather quite a bit. I bought a whole hide at Tandy Leather Factory in Columbus to sole felted slippers last winter, and hardly used any of it. Leather has such a rich texture and I love the slightly furry feel of suede. 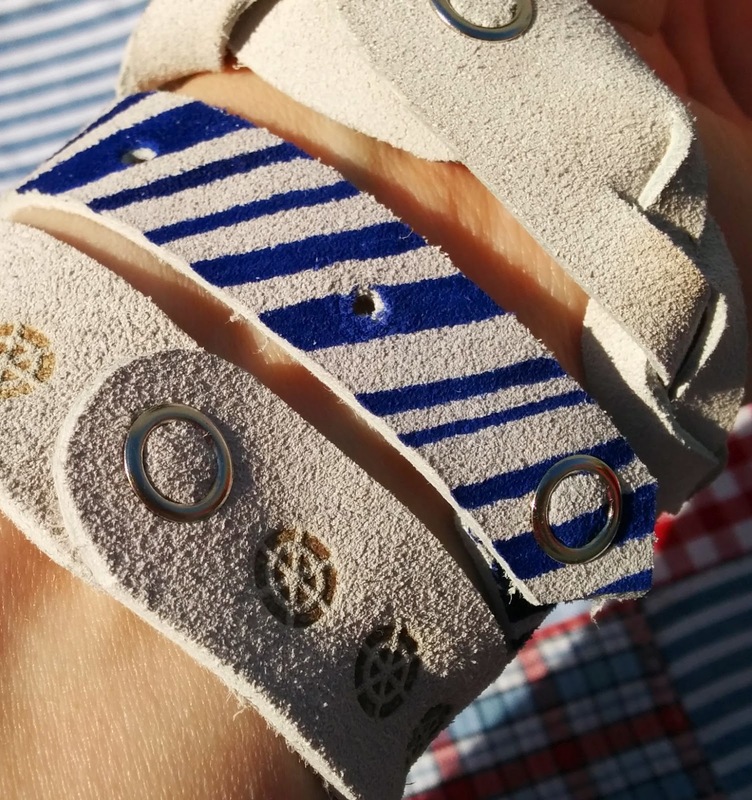 This week I've tried a few different techniques to create leather bracelets and cuffs. The first was a magic braid. It looks like it's braided from three separate strands but it's one piece. There's a great tutorial on I Still Love You, Melissa Esplin's blog, so I won't go into details here. You can make all of these in varying widths, textures, and colors to suit your taste. Thrifted skirts are a great source of thinner, soft suede if you don't want to buy a hide, and there are many places to buy leather pieces or bags of trimmings online. 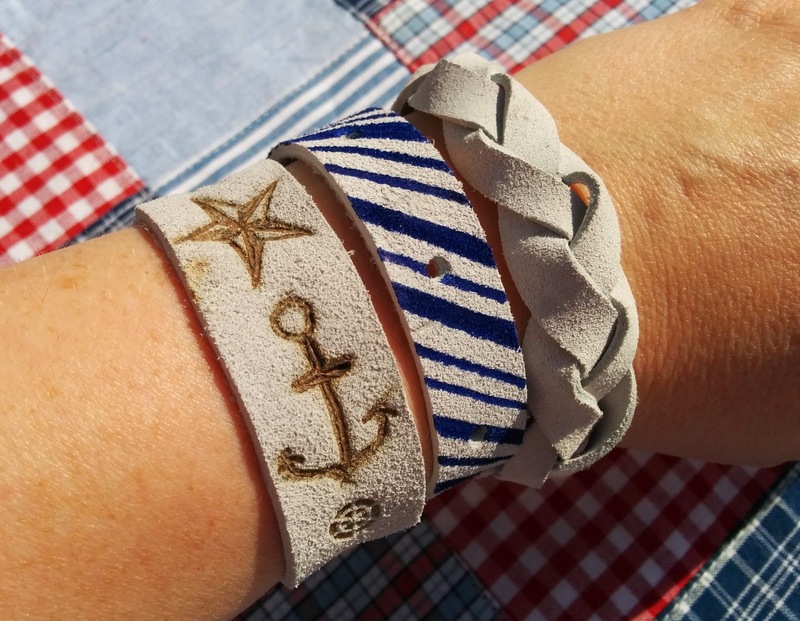 To make the burned anchor and star designs, I used the Walnut Hollow Versa Tool I picked up at JoAnn's last week. It can be used for a variety of crafts and as a soldering iron. I've been experimenting with wood burning, and today I tried it on leather. It came with all kinds of small design stamps and points for freehand burning. The first thing I want to tell you is this really stinks! I knew it would smell some, but the odor of burning keratin (the same protein causing horrid burnt hair smell) was just awful, and persisted in the finished cuff. I'm hoping it'll go away if I leave it on the porch to air for a few days. Also, when I pressed the iron into the leather, the surrounding area sort of rippled. I think I could get rid of it with pressing, but just a heads up. The tool was very easy to use and I like the branding tips it came with. I bought some Purple Cow tips on clearance at JoAnn's, too, and was pleased to find they fit my tool perfectly. I'd planned to share a tutorial on leather burning now that I've done a couple of projects, but I'm just not that happy with the results. However, I like the odor and effect of wood burning much better, and plan to make some small wooden charms so a tutorial may still happen. A final, and very kid-friendly, technique is just drawing on leather with Sharpie markers. You can see my striped bracelet above and the zebra pattern cuff I drew for one of my sisters at right. If you're stumped on how to decorate your cuff, go to your Pinterest boards for inspiration. What animals, prints, or other themes do you love? For me, nautical is number one! Practice ALL techniques on scraps if you haven't done them before. Leather is tricky and unforgiving. 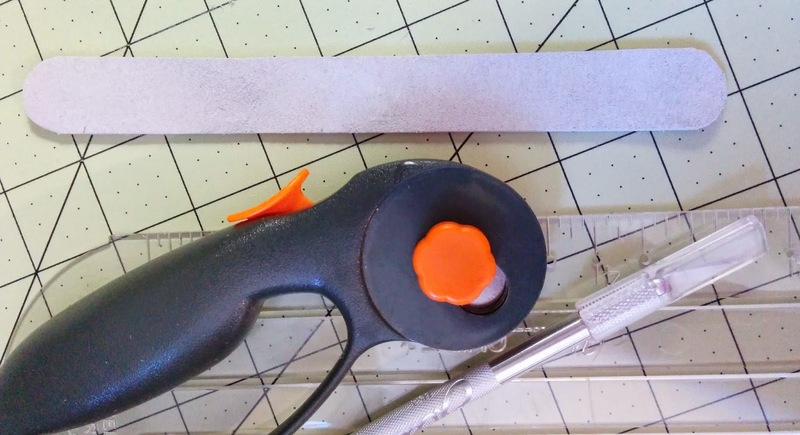 If you're crafting with kids, adults should cut the leather. Choose how wide and long you want your cuff. When you measure, make sure to add an extra 1 to 1.75 inches for the ends to overlap and snap together. Cut using rotary cutter. I like to round off the corners, but you can leave them square or cut at a 45 degree angle. Draw! You may want to sketch your ideas on paper first, then in pencil on your cuff before moving onto permanent marker. If you draw lightly you can erase pencil marks. Apply snaps. If you've never done this before, try Sew4Home's excellent tutorial here. Double check your snap placement-on a cuff the ball snap is on the wrong side and the socket snap is on the right side. 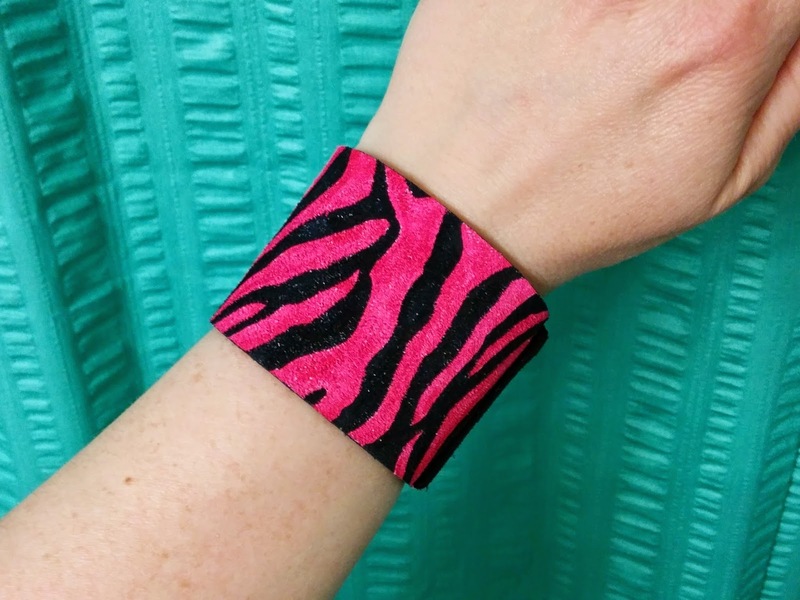 See the last pic below, which is the inside of the hot pink and black zebra cuff. On fabric you can usually just push the spikes on the ring part of the snap through like the tutorial shows. 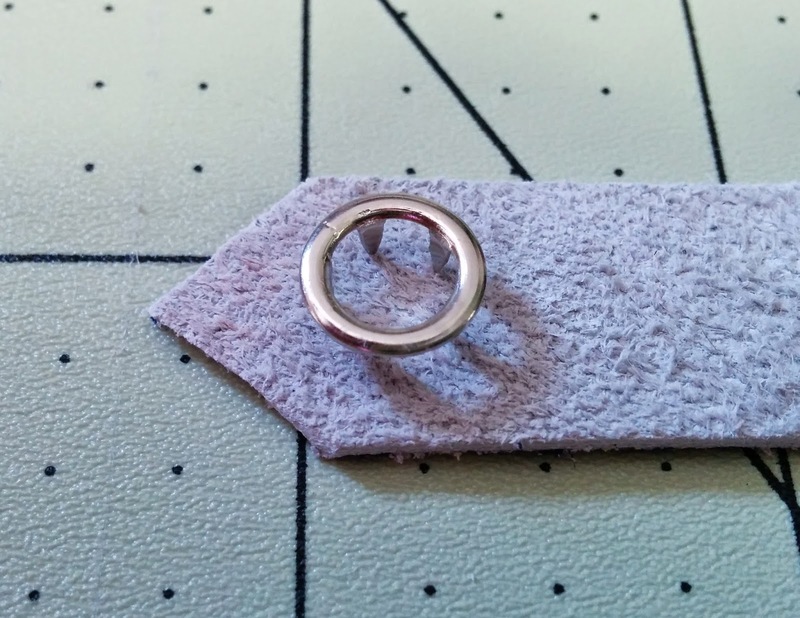 On leather you'll want to push down hard on the ring to make dents, then cut very tiny slits with a craft knife. When using my pliers to attach snaps, I like to squeeze slowly, then rotate them 90-180 degrees and squeeze hard to finish setting. They're very tricky to remove if they don't go on right. You may want to apply your snaps, then create your design just in case it doesn't go well. If you don't have a snap tool, you can buy snaps and eyelets that come with special hardware you use to apply snaps. You set up and assemble the snap, then hammer on it to push the snap pieces together through the leather. It works, but if you have a lot of snaps to apply or don't like noise, the Dritz tool is better. As always, post a pic of your project online and a link in the comments! 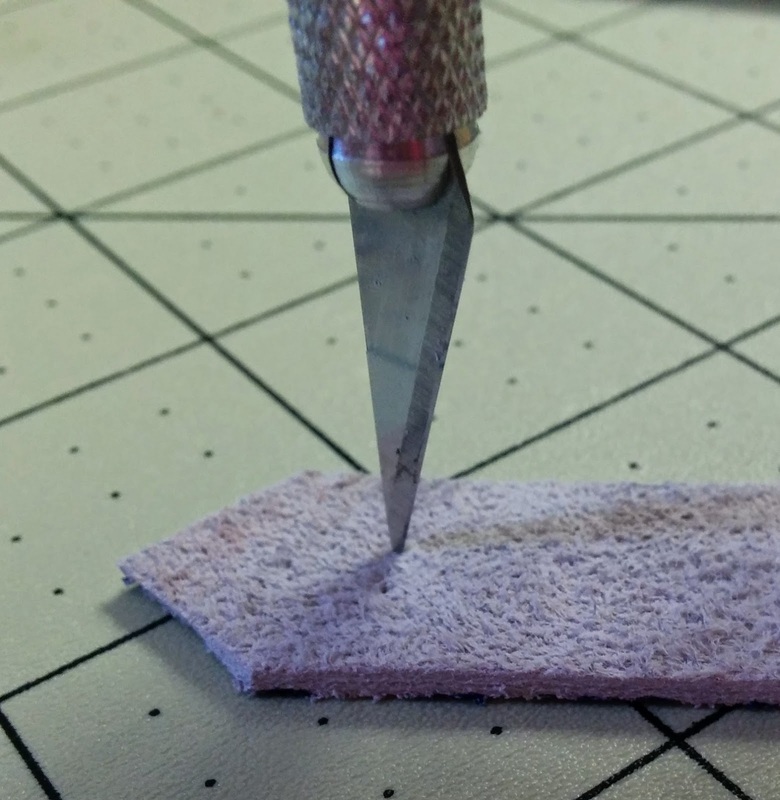 Cut your leather with pinking shears or other fancy edged scissors. Or fringe the edges. Poke holes with an awl or punch, or slit with a craft knife. Weave ribbons, cord, lace, leather lacing, etc. through. You could make your cuff look like a corset or even a sneaker. Add studs, eyelets, buckles, or other hardware in any color or shape you like. Make your cuff double-sided so you can change it to suit your mood or outfit. Leather strips with monograms or book quotes make classy bookmarks. Thanks for stopping by and keep living the Qute life! Willkommen, bienvenue, welcome, come on in!